Luxman CL-38uC Valve Pre Amplifier is an attractive custom vacuum tube control amplifier with Shunt Regulated Push Pull system. Luxman CL-38uC Valve Pre Amplifier uses SRPP (Shunt Regulated Push Pull) circuitry for all stages to achieve the highest sound quality possible. A genuine phono equaliser is included, the MC-low and MC-high impedance (gain) inputs each have independent MC transformers and are selectable using the MC impedance lever switch.Tone controls enable the listener to fine tune the sound quality. Refined exterior design and newly added balanced inputs make this vacuum tube control amp a new standard for its generation. Since the launch of SQ-5A vacuum tube integrated amplifier in 1961, Luxman have continued making vacuum tube amps without a break. Luxman have produced many models that are highly valued as signature models and satisfied music lovers are enjoying them to this day, even several decades after their release. The CL-38uC and MQ-88uC combine LUXMAN's history of producing fine vacuum tube products and the traditional wisdom and skills gained along the way. Due to their relatively simple circuitry, vacuum tube amplifiers are greatly affected by the quality of individual components, hence they utilise LUXMAN's own high-quality transformers and blocking capacitors. Further customisation comes in the form of Nichicon made, high voltage, metalized polypropylene film coupling capacitors, which have been introduced for their supple, natural tone. Improved audio quality has been realized by shortening the internal wiring. The CL-38uC control amplifier and the MQ-88uC power amplifier are based on the latest technology and design, but the exterior styling evokes a classic image from the heyday of vacuum tube audio products. The CL-38uC is modeled on the CL-35, released in 1970, and the MQ-88uC is modeled on the MQ-60, released in 1969. A classic front panel design should be functional, but also beautiful, achieved by careful selection of knobs and lever switches. Listeners can appreciate such traditional design features, with their nostalgic flavor, whilst enjoying these contemporary, high performance audio products. Each CL-38uC control amplifier and MQ-88uC power amplifier undergoes a final performance check after a 48 hour aging process following assembly. Luxman have selected JJ Electronic (Slovakia) vacuum tubes for these models as they are renowned for their reliability, long life and the ease with which they operate at vacuum tube amplifier voltages and heat dissipation conditions. 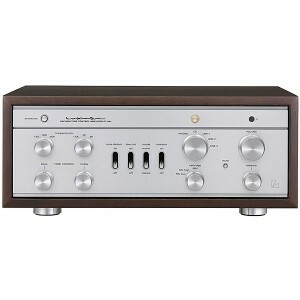 Luxman have retained the outer wooden case, as it represents the tradition of the 38 series. The chassis has been expanded to a width of 440mm which is the standard size for current Luxman products. The internal chassis acts as an omnidirectional shielded metal enclosure. In order to prevent magnetic flux leakage and eliminate noise, the toroidal power transformer and choke transormer have integral shielded cases. The CL-38uC's SRPP circuitry, used for the phono equalizer section, tone control section and amp section, ensures a flat frequency response and has other advantages, such as a low output impedance (300 ohm), low distortion and extended vacuum tube life. The elegant construction of such a control amplifier in a dedicated enclosure allows us ample space to mount a full complement of vacuum tubes inside, realizing clear and accurate musical expression and enviable sound quality for music lovers and enthusiasts. The CL-38uC’s balanced input terminals have dedicated transformers, improving integration with other high-end equipment. The built-in phono equalizer circuit is compatible with MM and MC cartridges and is equipped with step-up transformers for MC cartridges an independent left & right two step gain selector. The three-position switchable crossover frequencies for bass and treble tone controls enable the listener to fine tune the signal to the desired tonal character. The CL-38uC comes with a compact aluminum remote control, making it easy to control the volume smoothly from your listening position.